AN Australian-first facility helping men to find their place has reached another milestone. Springvale Multicultural Men’s Shed held its first annual general meeting (AGM) on Tuesday 14 July. The shed opened on the Springvale Uniting Church site in February, more than five years after Reverend Paul Creasey took the idea to the community. “Today is an affirmation of the initial vision from the Springvale Uniting Church, who responded to a need,” councillor and shed chairwoman Roz Blades said. “The inception of this shed has not been in isolation. “What we have today is the result of visionary thinking by Paul Creasey and the committee of the Springvale Multicultural Men’s Shed. The shed has hosted a Catch Up Cafe every Wednesday from 10am to noon, where about 10 men talk, listen and support each other over a hot cuppa. “Lunches are planned with our current shed users and partners to build friendships, an opportunity to think about nutrition and celebrate food from other cultures,” Cr Blades said. An art group runs each Thursday morning. “We are very fortunate to have forged a community relationship with the Springvale RSL who have been most supportive to this project,” Cr Blades said. The RSL cash also funded the shed’s first community development worker Charlie “who we are sure will forge links into the local community”. A music group runs each Thursday and includes playing, learning, singing and listening. “We have entered into a partnership agreement with Springvale Neighbourhood House where they hire the shed for English classes for new migrants and asylum seekers,” Cr Blades said. The shed has held two successful fund-raisers in the past 12 months and has received grants from City of Greater Dandenong, which also translated leaflets into nine languages. The Department of Health and Human Services has also funded solar panels, a split-system air-conditioner and a water tank. Cr Blades said the shed would expand its programs, services and activities through community consultation. “Moving forward, I think we need the services of a committee member who can both source and write grant applications, in order for us to expand our services,” she said. 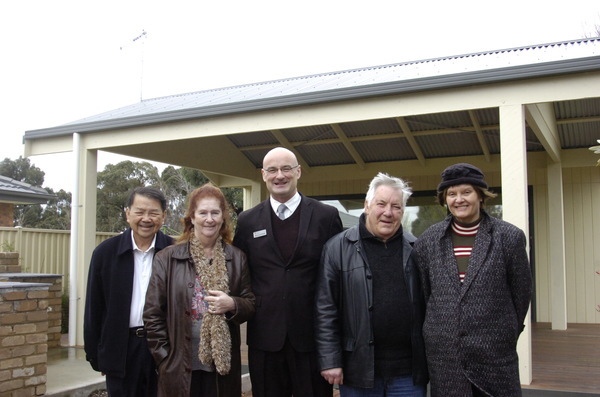 Mayor Sean O’Reilly said the shed was off to a “more than flourishing start”. “I look forward to seeing the men’s shed kicking more goals in the future,” he said.